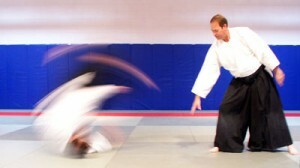 Aikido uses circular motions and blending movements, combined with solid balance and a low center of gravity, to join with, and redirect an attackers force. Develop confidence and physical endurance as you learn self defense skills. You’ll learn the art of ukemi (taking a fall) along with several defenses against grabs and punches. Each session consists of warm-up exercises, ukemi practice (taking a fall without injury), defensive techniques, and cool down exercises… all in easy-to-learn steps. 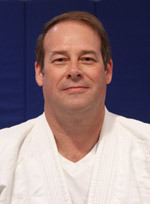 Wayne Massey Sensei has been practicing Hombu style Aikido since 1987. He began his studies at El Paso Aikikai under the guidance of Oscar Medina Sensei. After several years of intense practice, Massey Sensei became an assistant instructor at El Paso Aikikai. In 1997, Massey Sensei was promoted to chief instructor at El Paso Aikikai. El Paso Aikikai, is affiliated with the United States Aikido Federation, Eastern Region. Massey sensei is now a student of Yoshimitsu Yamada Shihan (8th degree black belt and head of the United States Aikido Federation; Eastern Region). Wayne Massey Sensei holds the rank of Yon Dan (4th degree black belt) and is a Shidoin (Senior instructor and Examiner) in the U.S. Aikido Federation. Yoshimitsu Yamada sensei studied Aikido in Japan for many years under the guidance of the founder of Aikido, O’Sensei. Yamada sensei was Uchi Deshi to O’Sensei. In 1964, Yamada Shihan relocated to the United States to teach Aikido and to serve as a point of contact for Aikidoka. Yamada Shihan holds the rank of 8th Dan (black belt) and the additional title “shihan” (master teacher). Yamada sensei periodically travels to El Paso to conduct training seminars for the US Aikido Federation, Eastern Region affiliated schools located throughout the southwest. Photo: Yamada Shihan demonstrates “Kaitenage”. Ukemi by Donovan Waite Sensei. Morihei Ueshiba (sometimes spelled Uyeshiba), the founder of Modern Aikido, passed away in 1969. Since his death, many systems of Aikido have sprung up throughout the world. El Paso Aikikai is affiliated with Hombu Aikido through Yamada Sensei of New York Aikikai, and the United States Aikido Federation, Eastern Region.